U.S. Pacific Fleet Commander Adm. Harry Harris' remarks come after tensions have escalated in recent years over territory in the South China Sea. CANBERRA, Australia, April 1 (UPI) -- A top U.S. Navy commander said China's construction of artificial islands in the South China Sea is unprecedented and Asia's largest economy is creating a "great wall of sand" that is drawing the ire of neighboring countries. 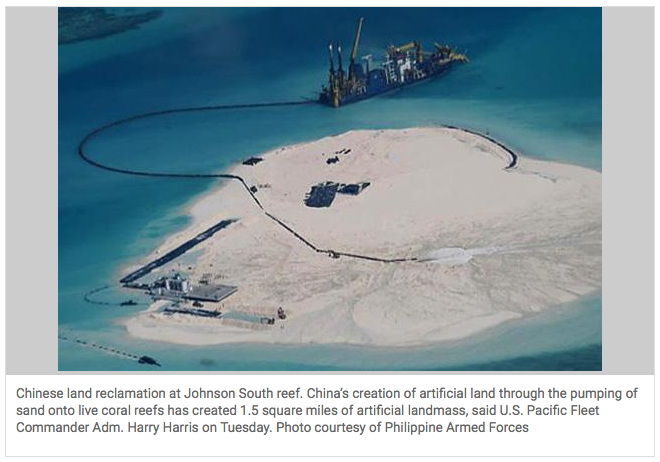 U.S. Pacific Fleet Commander Adm. Harry Harris said ＊Tuesday that China's creation of artificial land through the pumping of sand onto live coral reefs has created 1.5 square miles of artificial landmass. "China's pattern of provocative actions toward smaller claimant states...is inconsistent with international law," Harris said in a speech at the Australian Strategic Policy Institute. The BBC reported China has claims over waters in the South China Sea that conflict with Vietnam, the Philippines and Taiwan. All countries are locked in a dispute over the Spratly Islands. Tensions have escalated in recent years over territory in the South China Sea. The Philippines has filed a complaint with the U.N.'s Permanent Court of Arbitration. China, however, has refused to respond to the complaint. China has justified its activities near the Spratly Islands by insisting land reclamation is for the "purpose of improving the working and living conditions of people stationed on these islands." Harris said the United States and other countries urge all those involved in the territorial dispute to follow the 2002 China-ASEAN "Declaration of Conduct," and that all parties conform to the exercise of self-restraint that can prevent the escalation of tensions. But China's increasing activities in the South China Sea have provoked the anger of nearby nations. The BBC reported anti-China violence erupted in Vietnam after China relocated a drilling rig into disputed waters near the Paracel Islands. financial or political gain. We contend with complex issues like terrorism, cyber-crime, piracy, trafficking in all its bad forms, trans-national criminal activity, even the proliferation of weapons of mass destruction. Then there are volatile threats like North Korea, which just rejected calls to apologize for the deadly sinking of the South Korean Navy corvette Cheonan, which occurred five years ago last week. Forty-six sailors died in that attack, a powerful reminder that North Korea remains both a dangerous and an unrepentant nation. It seeks nuclear weapons and a missile system that can deliver them throughout the region. That, folks, keeps me up at night. We also see the misuse of maritime claims by some coastal states. The excessive nature of some of these claims is creating uncertainty and instability. These disruptions should compel us to increase cooperative efforts in this region,like those announced earlier this month, right here in Canberra, between Australia and Vietnam. Prime Minister Abbott said both nations, and I quote, "support freedom of navigation by air and by sea in the South China Sea. We both deplore any unilateral change to the status quo. We both think that disputes should be resolved peacefully and in accordance with international law." Unquote. Competing claims by several nations in the South China Sea increase thepotential for miscalculation. But what’s really drawing a lot of concern in the here and now is the unprecedented land reclamation currently being conducted by China. China is building artificial land by pumping sand on to live coral reefs –some of them submerged – and paving over them with concrete. China has now created over four square kilometers of artificial landmass, roughly the size of Canberra's Black Mountain Nature Reserve. The Indo-Asia-Pacific region is known for its mosaic of stunningly beautiful natural islands, from the Maldives to the Andamans, from Indonesia and Malaysia to the Great BarrierReef and Tahiti. And I get to live in the beautiful Hawaiian Islands, in one of nature's great creations, a magnificent geography formed by millions of years of volcanic activity. In sharp contrast, China is creating a great wall of sand, with dredgesand bulldozers, over the course of months. When one looks at China's pattern of provocative actions towards smaller claimant states –the lack of clarity on its sweeping nine-dash line claim that is inconsistent with international law and the deep asymmetry between China’s capabilities and those of its smaller neighbors –well it’s no surprise that the scope and pace of building man-made islands raise serious questions about Chinese intentions. The United States and other countries continue to urge all claimants to conform to the 2002 China-ASEAN "Declaration of Conduct," where the parties committed to "exercise self - restraint in the conduct of activities that would complicate or escalate disputes and affect peace and stability." How China proceeds will be a key indicator of whether the region is heading towards confrontation or cooperation.